Gorgeous! I’m considering getting the Noodler’s Konrad Flex Pen both for drawing and writing. How do you rate it? Five stars! 🙂 I very much love the Konrad flex pens…though I do get more use out of my Ahabs. They have the same nib and feed, which is great for both writing and drawing. I just prefer the look and feel of the Ahab. Both pens lay down a nice, wet line. They are also easy to adjust and maintain. If you like the Konrad, at $20 for a flex pen, you can’t go wrong! I have been longing for the perfect sepia for some time. I wanted ink that would capture the look of a faded old document. I bought some Private Reserve Copper Burst, but it was not quite right. Then I stumbled on your ink review. Eureka! I have found it! 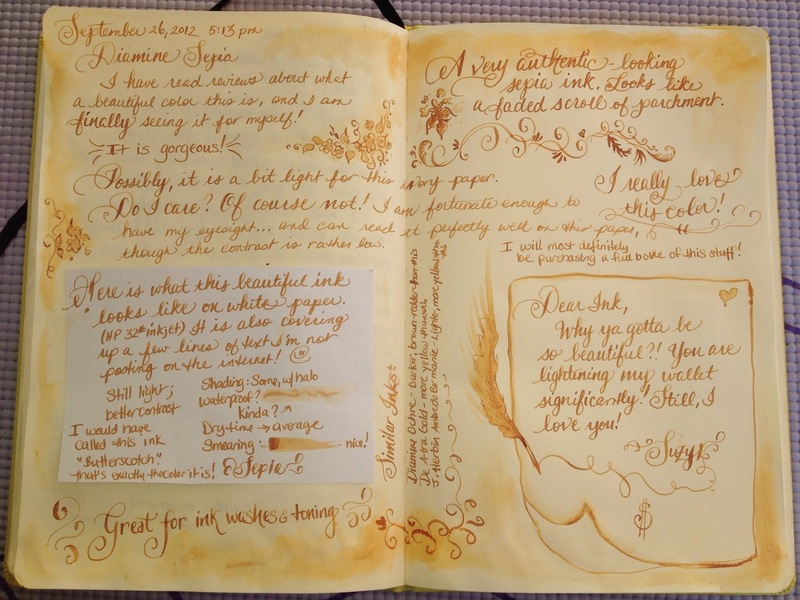 Thank you for sharing this wonderful example of what Diamine Sepia can do. Loved the review, i bought the ink just because i saw your review. I plan to use it on a beautiful leather journal i bought, the pages are beige and i really want it to look like an old vintage journal. I would love to decorate the first two pages the way you did here. If you don’t mind, could you please do a quick tutorial on how you created the stain effect around the pages?